‘Twas 1 am, two nights before Christmas, when all through Orlando airport, relatively few people were stirring. Waiting in the parking structure was a “premium” rental car of our choosing. My mind pondered the options, the “four door sports car” Maxima or perhaps the Dodge Charger. Then my dad got into an Avalon. Before I get into this review, I have a huge disclaimer that the title hints at. I did not drive this car so I, naturally, cannot comment on its driving dynamics. I can, however, assume that the Avalon did not have any offensive qualities. Toyota can’t shock the grandmas that buy these cars with heavy steering or a touchy throttle. But, it is important to note that our particular car did have a transmission quirk. After shifting from reverse to drive, the transmission would slip when starting off. I have a feeling that this could be contributed to its life as a rental and the few neutral drops I suspect it has been subjected to. The only thing my dad commented on was how the well the brakes worked compared to his 2006 RAV4 with 200,000 miles on it. If we made a typical tourist mistake and almost missed a turn or had to stop for a sudden yellow light, the car would really stop. In the backseat, I could feel the initial bite from the harder braking, but they weren’t so jerky they could knock grandpa’s dentures loose. I think the Avalon just drove exactly like you would expect a 2015 Toyota with 15,000 miles on it to. So, moving back to the parking garage, I thought that the Avalon looked pretty good under the dim lights. There’s nothing too new and exciting about it; it’s just fine. But as I saw it in the daylight over the next few days, I began to appreciate the design. There are nice hints of chrome on the trunk, the door handles, and window surround, which contrast nicely against the black paint. The character lines running down the side of the body are also visible in the dark paint, but they are not too jarring. Up front, Toyota managed to combine the older style silver trim around the logo with their new gaping grill underneath. Interestingly, I thought that the grill worked rather well in this car, especially with the Acura like jewel headlights. I do think that the black paint worked in the Avalon’s favor, though. It helped the dark grill blend into the front bumper. Overall, the design works very well on this car. It doesn’t look an angry victim of Uma Thurman after she acquires her samurai sword in Kill Bill, unlike its Lexus brethren. Now, I’ll get into the area where I have the most expertise, the backseat. This Avalon has one of the biggest backseats that I have sat in. I’m 6’ 2” and my knees had at least six inches of breathing room, and, keep in mind, the seat in front was not pushed that far forward. The seats were also big enough for my sister and I to share the space with a larger sized suitcase without getting too up close and personal with it. Luckily, since the Avalon has a huge trunk, we didn’t have a problem fitting the other three suitcases where they rightfully belong. But a potential problem for Avalon owners that received a particularly large painting from the grandkids or renters who would like to use their “premium” car like a pickup is that the rear seats do not fold down. I think this is due to the rear torso airbags that live in the backseat. There is a small pass through in the middle seat, however. This lack of flexibility was not a problem for us since we had four people on this trip and could not have folded seats, even if we wanted to cram a couple more suitcases into the car. When the suitcases were stored in our condo, we were able to enjoy a very solid armrest and the plush white seats. Adding to luxuriousness, the door materials in the back match the front doors. I really appreciated the thought that went into the doors. The picture doesn’t do it justice, but my favorite feature was the flowing piece of brushed plastic that runs from the window switch into the little storage compartment. The armrest was a dark navy blue that almost looked black, and stitched leather adorned the door panels. The blue contrasting leather-ish material worked its way forward onto the center console and surrounded the cup holders. Basically everything you touch is soft plastic or leather. The dashboard in front of the driver and passenger is coated in stitched leather, and the top of the dashboard gets the same treatment. But the stuff you rarely come into contact with or that you want to be tougher, like the lower parts of the doors, is not squishy. Honestly, the quality is about on par with the 2004 Lexus RX330 I drive, but with more stitched leather. I would even say that it’s quieter, but it should be for a car 11 years newer with 190,000 less miles on it. Now, it’s apparent that Toyota put thought into the areas that automotive journalists seem to fawn over like soft touch materials and sound deadening, but Toyota also put tons of thought into the rest of the car. All the windows are one touch automatic. There are ten airbags total, including the rear torso airbags and two knee airbags lurking in lower part of the dashboard. I could also tell that Toyota put a lot of thought into the suspension. The Avalon was tuned to be surprisingly firm in what I can only assume is an attempt at being sporty. Now, this does not mean the car was slamming into road imperfections, but there was no bounciness in this suspension either. Bumps did not unsettle the car too much and did not upset the suspension for long, which meant the jostling in the cabin was minimal. However, the Avalon still managed to feel smooth and comfortable. In another effort to feel sporty and attract younger buyers, Toyota placed paddle shifters behind the Avalon’s steering wheel. It also has tech features to reel them in, too. A touchscreen radio is standard with a handy little feature that syncs driver settings to their phone through Bluetooth. So when one driver sits in the car and their phone connects, the car automatically changes settings in the stereo and other systems for them. However, I think the capacitive touch buttons that surround the system let it down. They react quickly enough and Toyota honorably kept the volume and tuning knobs, but there is a bit of a learning curve to them. Personally, I would rather have physical buttons and I bet there are a few frustrated 70 year olds out there that agree with me. Now, something I had no gripe with was the power the car produced. It has the 3.5 V6, which churns out 268 horsepower and 248 foot pounds of torque. It’s enough to hustle this 3,500 pound car to 60 in 6.1 seconds. While this engine is not new for Toyota, it is still very potent. I did not expect the Avalon to move with such force. There’s plenty of power for the situations tourists get into, like needing to get ahead of three lanes of traffic at a stop light to get from the left lane to the right lane. This car will easily spin its front tires and the power is, without a doubt, the best part of the Avalon. But there is a secret bonus to this. 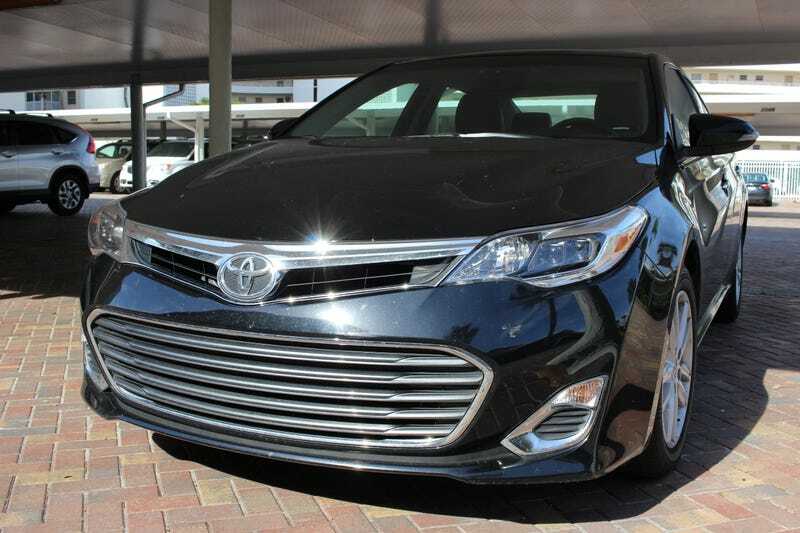 Full throttle acceleration runs and tire squealing cornering are not expected in an Avalon, especially in Florida. Every Avalon that I saw on the road, apart from a few rentals, was being piloted by an elderly woman. This puts the Avalon in a perfect position as a rental. It’s comfortable, spacious, quick, and it flies under the radar as you drive it like the next Lewis Hamilton, or grandma when she’s running late to church.